When the innovative marketing director at FCC Services, first spoke with us about rebranding their Gettysburg Leadership Experience, we were intrigued. How often does a design group like EnZed have the opportunity to develop a fresh identity for a program merging 19th Century lessons and 21st Century leadership? The result, I’m delighted to say, has garnered enough participant interest to fill all 2015 Experience sessions and cause more to be slated. (It’s also led to our being asked to develop special materials to help FCCS celebrate their 40th anniversary and re-energize their conference offerings.) In brief, The Gettysburg Experience brings corporate executives to the Gettysburg battlefield for an intensive exploration of decisions made during that nation-changing three-day conflict. The goal is to examine what happened at that Civil War turning point and translate it into practical leadership strategies to guide one’s personal and corporate path forward. 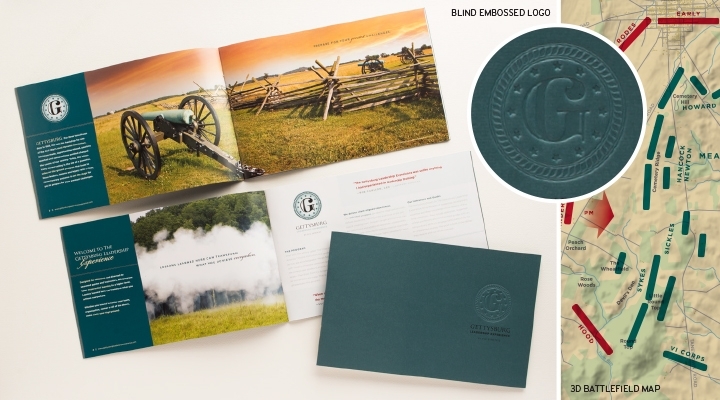 EnZed’s initial scope of work included a new logo, program graphic design, marketing collateral and on-site materials for participants to use during their Gettysburg “boots on the ground” journey. Moreover, our copywriter Carla Carwile was to provide web text for project co-partner, Rabble + Rouser. But something happened on the way to final product. You are currently browsing the EnZed Design blog archives for December, 2014.